Happy birthday to my 3rd great-grandfather born on this day 157 years ago! Pehr August was born on the 1st day of the 1st month and was baptized two days later. In the column following the new baby’s name are the names of his parents; Blacksmith (Spikmed) Carl Tolf and his 35 year old wife Helena Stina Ahman. Pehr was the couple’s 5th child, born at Spikbruk in the parish of Svenarum, district of Västra, and the county of Jönköpings in Sweden. Parish registers for Svenarum exist back to 1689. Pehr and his parents and three of his siblings (Christina, Frida and Amanda) boarded a ship bound for America in May of 1878. Pehr became Peter and celebrated his 20th birthday in his new home in Batavia, Kane County, Illinois, USA. Maja Lisa Lidstrom (1797-1856) and Carl Jonas Tolf (1795-1833). Interested in collaborating on Tolf family history? 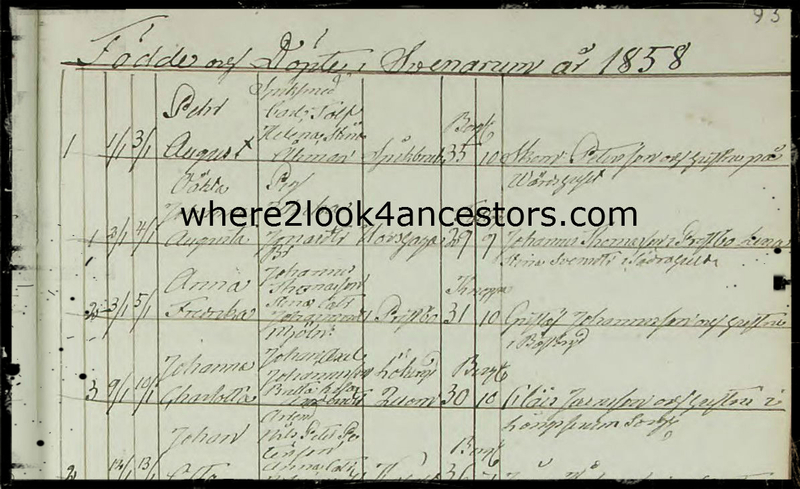 I can be reached at where2look4ancestors [at] gmail [dot] com. My 2015 goal for Peter is to learn more about the Batavia and Chicago churches in which he was involved. My 2015 organizational goal for Peter is to bring all of his documentation from out-of-date to up-to-date on Ancestry, Dropbox, Family Tree Maker, Find A Grave, and in his paper files. Guess I’d better get busy!